Slowly but surely, I'm running out of my trusty Redken Allsoft shampoo and conditioner. I bought a liter of each last year in the Ulta sale and had been planning to repurchase them (the line practically saved my hair from permanent chlorine damage) but Redken isn't a cruelty free line, so now I'm trying to find a replacement. Enter: Lush. I've been meaning to place an order since I started blogging, so safe to say it's been a long time coming! I browsed their shampoos, conditioners, bubble bars, bath bombs, scrubs, basically the entire website and added quite a few items to my cart. After hearing only the best things about the handmade brand, how do live up to the expectations? Unfortunately, my first impressions aren't great. I ordered four products: a shampoo, a body wash, a bath bomb, and a body/face scrub, and none of them smell good. I had been expecting a light, natural fragrance but these don't smell at all the way they are described on the website, despite having a great combination of ingredients that sound amazing on the bottle. The first thing I picked up was the Fairly Traded Honey shampoo. Luckily I only got a small bottle because I'm very picky with haircare and I wanted to trial it before committing to a big one. I'm obsessed with honey as an ingredient, I think it smells great and it has a lot of moisturizing benefits (which my hair desperately needs!) I figured that since fairly traded honey is the first ingredient in this shampoo, it would have a nice, light scent, but it somehow smells like chemicals. I don't like it at all and it was giving me a headache while using it for the first time. Though the smell bothered me, I did like how it makes my hair feel after the first use. My scalp felt clean but not stripped, and it didn't weigh my hair down at all. I will try to get past the fragrance and keep using it and see how it works long-term! The next product I think I'm going to get rid of, the scent got to me so much. I ordered a trial size of the Comforter body wash, which was supposed to smell like berries and bergamot, and again, just smells really harsh and gross. I would prefer a fake berry fragrance over this. Also, the use by date is July 17th and I didn't receive my package until July 3rd, so I only have a little over two weeks to use this if I were to follow Lush's recommendations. The Comforter looks pretty in the bottle but I do not want to use it again. 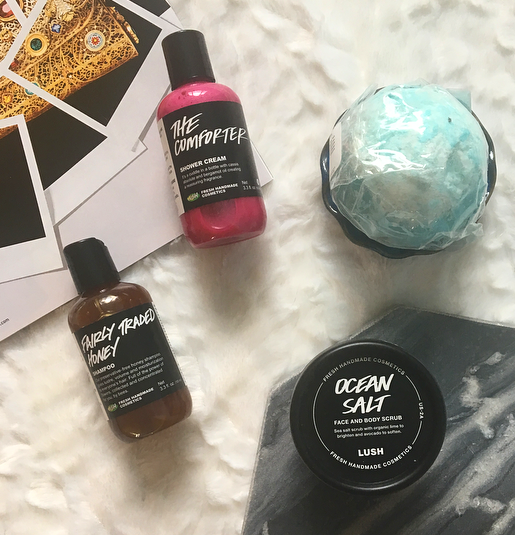 I also picked up the Ocean Salt scrub from Lush. This one's use by date is also the 17th, but I might be able to use it up by that time. You don't get a lot of product in here but you can use it on the face or the body. I used it on my legs and it worked well, though I usually prefer something more coarse. I don't like the scent of this product either, one of my main ingredients is lime extract but it doesn't smell anything like lime. Luckily the scent isn't as strong in this one! The texture is very interesting, I can't decide if I like it or not. There are both fine and coarse grains of salt in it and they are suspended in a strange moussey liquid. I think that this product is a bit overpriced considering how small it is and how much it cost, but it isn't a bad product from what I've tried! And the last product I chose is a famous one: my first Lush bath bomb! I'm obsessed with the sea and the water, so Big Blue sounded right up my street. I haven't used it yet, but I'm excited to. It is supposed to smell like lavender and lime and it includes sea salt and seaweed, which is intriguing. It'll fit my mermaid aesthetic for sure. Keep an eye on my Instagram @beautyfromkatie because I'm sure I'll post pictures of my first bath bomb experience! As to how I feel about Lush, I'm very much on the fence about them. I love that their products are handmade, cruelty-free, organic, fair trade, made from recycled materials, etc. but I would rather have a product smell like nothing than an overbearing fragrance that makes me dislike using it. It's possible that I picked the only duds from the whole range, but I think I got a good variety of products and none of them smell the way that they are described. There isn't a Lush store anywhere near me so online is the only way that I can get their products, and at the moment I'm hesitant to place another order. Please let me know if you've had an experience like this with Lush, or if there are any products of theirs that you swear by! 10 comments on "First Lush Haul"
I love lush products. They always smell fantastic and work so well, especially their skincare products. I love their mask of magnaminty. I'm always worried about order this sort of thing online because of scents, as I have chronic headaches I have to be very careful. I haven't use any of these, but I do love their Cup O Coffee mask scrub. Awesome haul, it's a shame you don't love them that much! I haven't ordered or bought much from Lush, only one bath bomb like four years ago haha! Aw what a bad first experience! Try to order some of their famous products, maybe you'll like the more! Great haul! I love Lush. I haven't shopped there in months, so this is really tempting! I love The Comforter. It smells amazing!